We got up a little after 8:00 and went downstairs for another good breakfast. 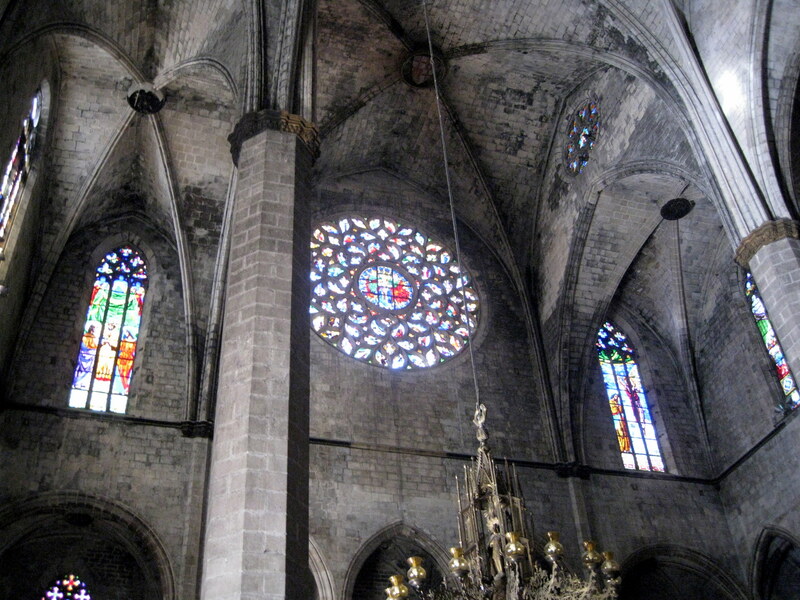 We walked over to Santa Maria del Mar church, which is a beautiful Catalan-Gothic church dating from the 1300s. 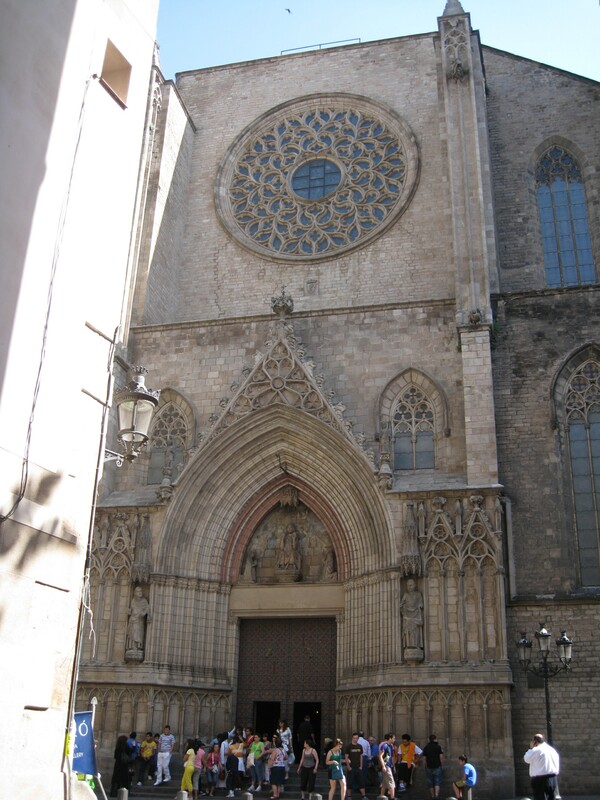 It was built during the reign of King Jaume II, who also oversaw the construction of Barcelona’s cathedral. Begun in 1324, it only took five years to complete. At the time, the church was situated on the seashore. Now it is some distance to the beach. 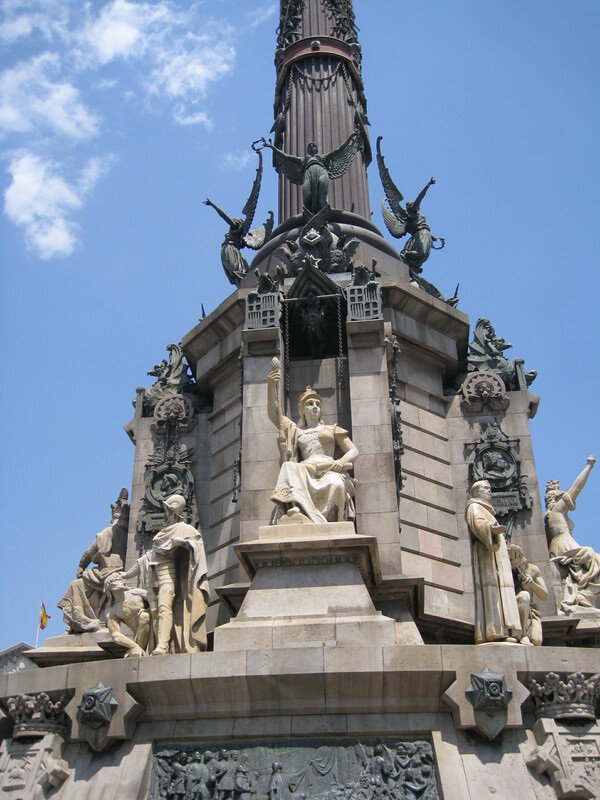 Its magnificence was intended to symbolize the naval supremacy of the Kingdom of Aragon. The church has a huge interior, octagonal towers, large bare surfaces, rib vaults and soaring vertical lines. 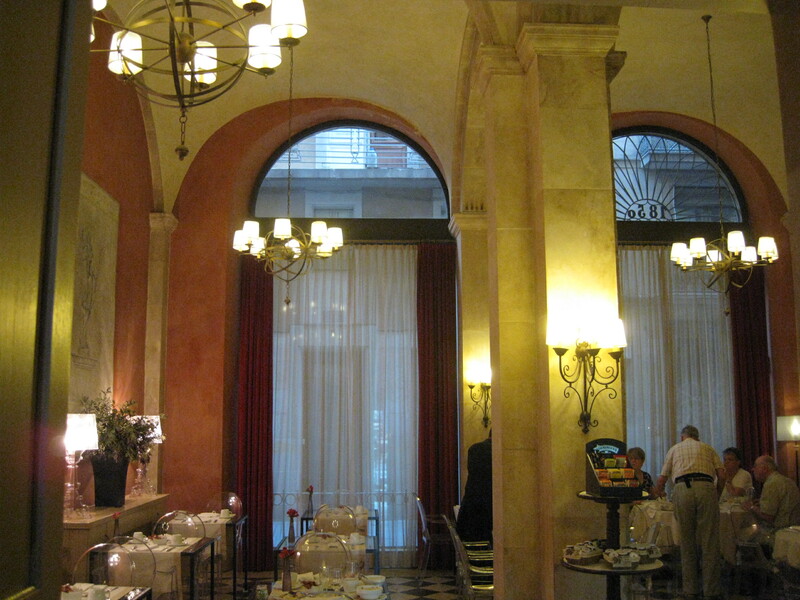 The interior was burned out in 1936 during the Spanish Civil war. 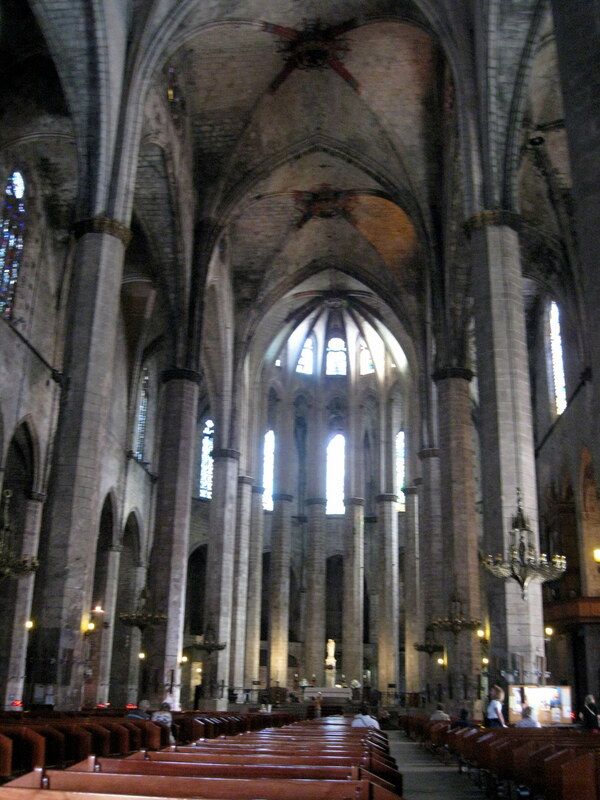 The interior was more like French Gothic than Spanish as there was no choir in the middle as in other Spanish churches that we have seen. An interesting noveIldefonso Falcones, Cathedral of the Sea. From there we walked up Via Laietana until we came to the stree t on which the Palau de la Musica Catalana. The front looked very Gaudi-like, but we couldn’t get a good look because the street was very narrow. We could not get a tour for today, but bought tickets for tomorrow at 11:00. I will also give a full description for Day 18. Buy your tickets early!! 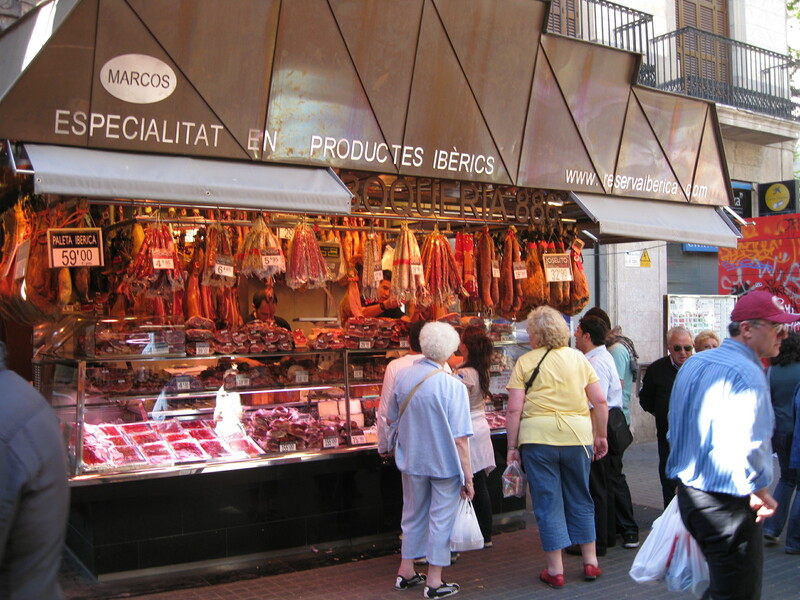 We walked back out to Laietana and found our way over to the Ramblas. We walked past the hotel where we stayed on the tour. Several blocks down, we stopped at a chocolate shop and had their famous hot chocolate. It was very rich. We also explored the Bocheria St. Josef which is the market. It was quite large with everything imaginable for sale. 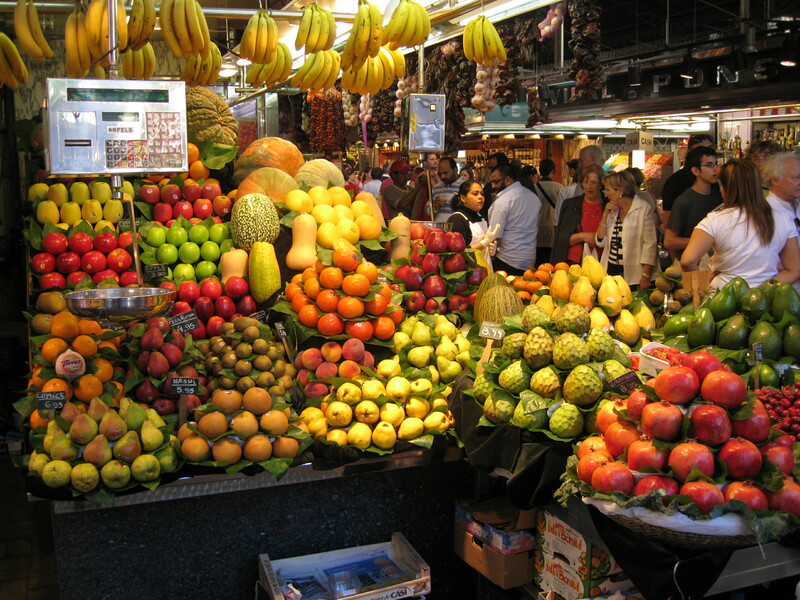 There was beautiful fruit displays, racks of ham hanging, tables of all kinds of seafood and meat, wonderful fresh vegetables, breads, sweets – all good enough to eat if we had had a place to cook it. After another short walk we found the information office so we might get information about music events. There didn’t seem to be any today or tomorrow. 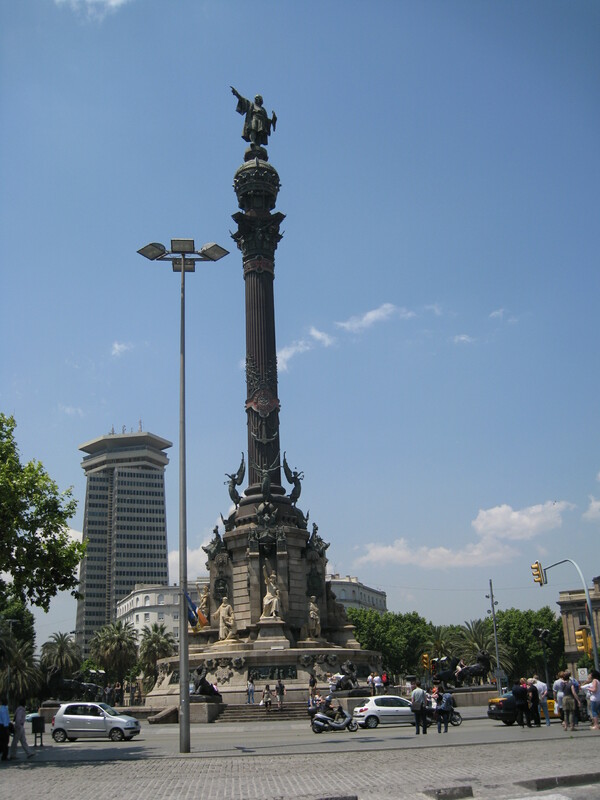 We walked all the way down the Ramblas to Columbus’ monument. 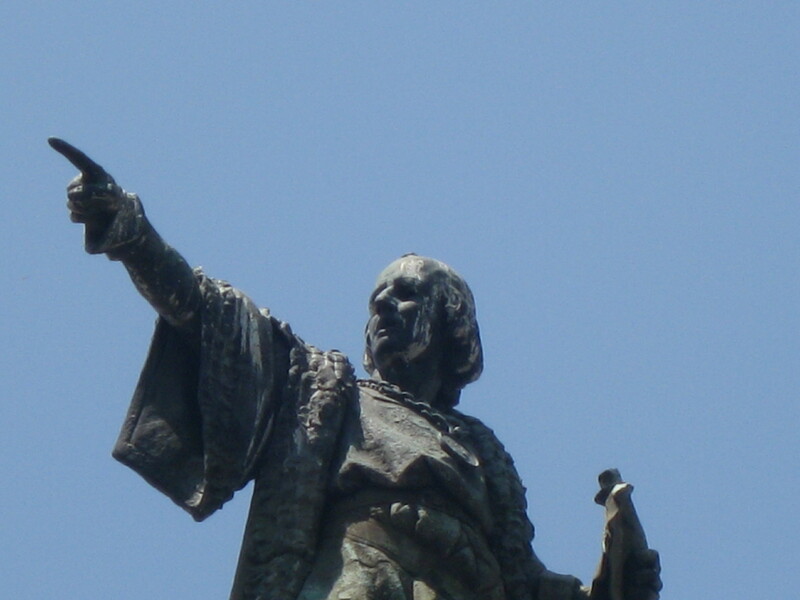 The statue was sculpted by Rafael Atche and is said to depict Columbus pointing towards the New World with his right hand, while holding a scroll in the left. As it was sited, instead of pointing to the west towards the New World, the statue points east towards Columbus's supposed home city of Genoa . The column, hung with a device bearing an anchor stands on an octagonal pedestal from which four bronze winged Victories taking flight towards the four corners of the world. Four buttresses against the octagonal pedestal bear portrait medallions that depict people related to Columbus. Seated against the buttresses are four figures that represent the four realms of Spain: Catalonia, and the kingdoms ofLeon, Aragon and Castile. The octagonal base has eight bronze bas-relief panels that depict important scenes in Columbus's first voyage to the Americas; alternating with the bas-reliefs are eight coats-of-arms representing locations that Columbus visited. This monument was most impressive. We crossed the street and bought tickets for a 35 minute cruise around the harbor. 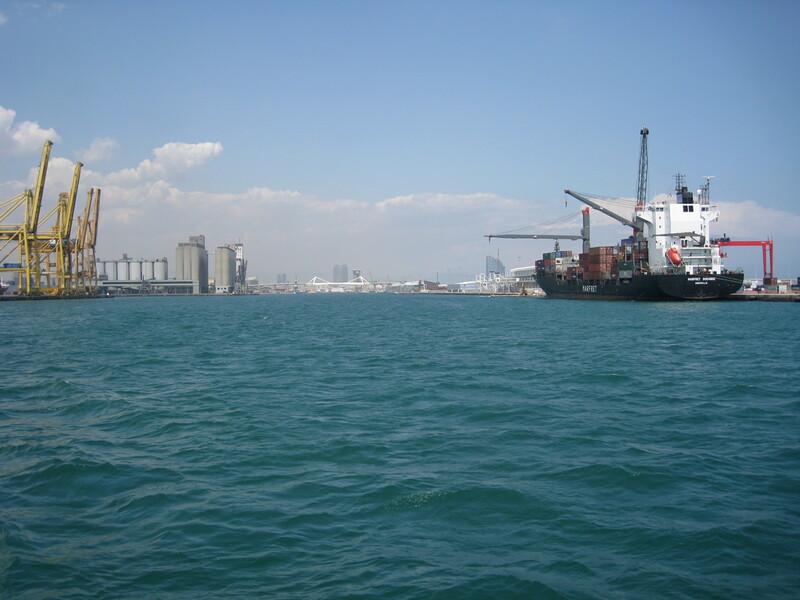 It was a bright sunny day and we had a good ride along the docks where we saw many large cargo ships and loading docks with their large cranes. We went back to our room at 3:00 and found that it had not been cleaned. We took our books and went up on the roof where there was a bar (no bartender), comfortable chairs and umbrella and a wonderful view of the harbor. We finally found someone who located a bartender and we enjoyed a refreshing drink. 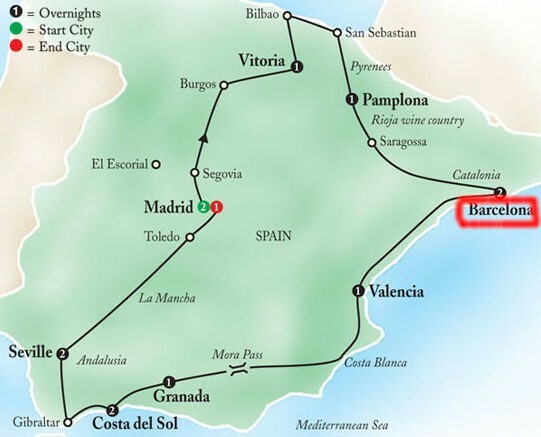 We walked back over to Barceloneta and had dinner at Casa De Estalivi. It was very crowded. There was a party of young ladies from England next to us who were celebrating someone’s birthday and an upcoming wedding. We had a fairly good dinner. My wife said it was too “brown”. We had a salad. I had calamari -too many to eat, and my wife had paella (again).